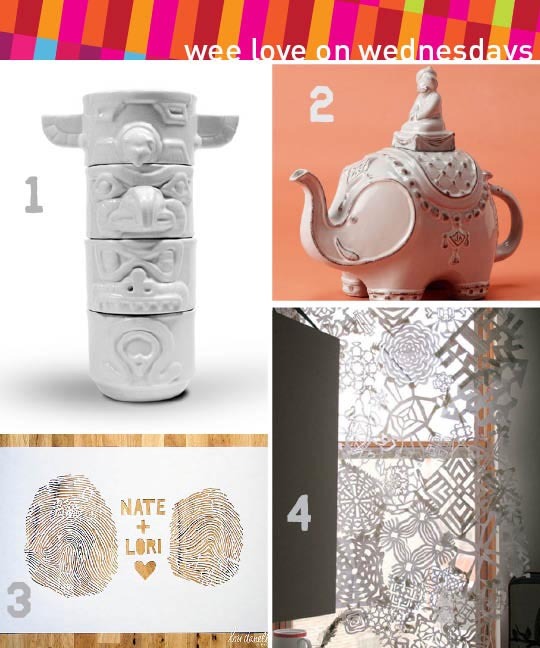 This week's lovelies — paper and ceramics. And lots of white. 1. Stacking Totem Cups. Space saving and awesome. 2. Jonathon Adler's Darjeeling Teapot. I'm trying not to want this. But it would be so lovely next to my white camel teapot. Just sayin'. 3. Lori Danelle, Paper Cut Artist and Maker of Things, is behind this beauty. Curious about her custom fingerprint paper cut artwork offering? Check it out here. 4. This is officially on my To Do List. A curtain made out of paper snowflakes!? Wonderful. Check out Free People for all the details (found via Poppytalk).